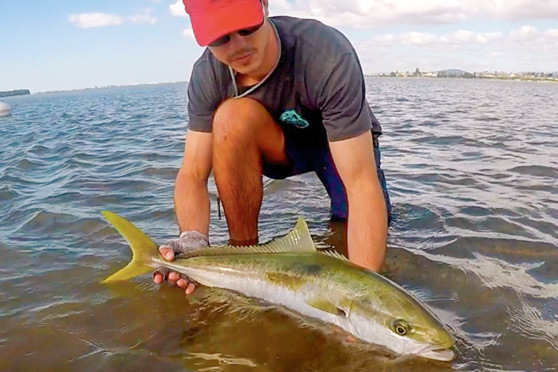 Targeting pelagic species such as kingfish in waist-deep water has become irresistible for many fly-fishers in recent years. I am no exception. There is nothing visually more exciting than seeing large, ocean-going fish up close and knowing they may well take your fly. It is no secret (although I wish it was) that Tauranga Harbour presents such an opportunity, with multiple television programmes, magazine articles and web postings publicising this relatively new form of fishing. It turns out kingfish have a close relationship with the harbour’s stingrays, with anything from one to four or five kingfish often swimming and feeding around or underneath them. These kingfish generally range in size from 2.5 to five kilograms. Following a successful trip to Tauranga in January pursuing kingfish, I was eager to return before the end of the season – only this time I would be more prepared and organised. 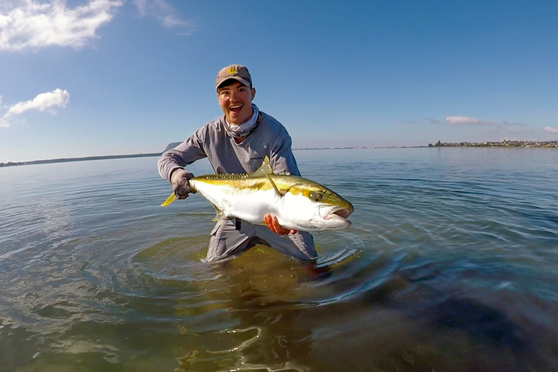 I had also planned around the tides, with high tides in the mornings and a new moon in the middle of my trip, but was a little worried that April would be too late – the water temperature could have dropped enough for the fish to have moved out already. As this would also be my last Tauranga trip before winter, I really wanted it to be a good one. I tried to keep my high hopes in check – you can plan for the tides and moon phases, but the weather cannot be taken for granted. Persistent wind or cloudy days can make fly fishing a tad difficult. The final session was to see me placed in the right place at the right time. I’d got up a little later since the pressure was gone – the trip had already fulfilled my expectations and more. However, there was no way I was not going fishing, especially on a day that was as beautiful as those preceding it, with clear water and skies, and not a breath of wind. As usual, I was armed with an eight-weight fly rod and my trusty 2/0 piper fly – a little beaten up by this time, having successfully dealt with several ray riders over the previous days. I started fishing as the tide changed, with the sun crossing at an angle that allowed for better spotting. Suddenly, in front of me, I spotted a small disturbance in the opposite direction to that of the surface ripple created by the gentle breeze covering the sand flat. I have learned from experience that everything unusual must be inspected, because it could be a fish. Sure enough, upon stealthily moving towards the displacement, a horde of baitfish erupted out of the water just a few metres away. 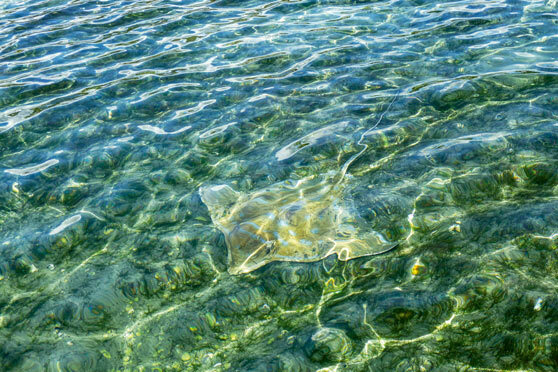 Since I could not see a stingray, could it have been caused by a solitary fish? No. Although my eyes initially locked onto a single approaching bow wave, this soon became two. I had my chance! I did my best to cast the fly two or three metres in front of the oncoming fish so it would end up between them; some healthy competition between the two fish made a refusal much less likely. Following a slight pause, I began stripping – and both bow waves rushed over, getting bigger and more pronounced as they zeroed in on the potential meal. Then the back of the closer fish came out the surface film, enabling me to get some idea of this fish’s size, and before I could say ‘*@#%!’, this lovely beast inhaled the fly. My reel’s drag was maxed out from the get-go, because these fish need to be fought hard and stopped at the first opportunity. Otherwise, they will run you out of backing and quickly be no more than a memory. Well, that’s the theory, anyway – this fish had other ideas, taking all the fly line in just seconds, then keeping on going. Despite heavy drag pressure (too tight for me to pull any line off the reel), I lost 80 metres of backing before finally turning its head for the first time. An hour of grunting, sweating, straining hard work followed, with the line repeatedly wound in, only to be lost again soon after. Throughout the fight the fish seemed to find comfort in a deep channel, but I liked it much less, imagining large bronze whalers, wrecks and debris, all out of view and potentially jeaparding my chance for success. It took some time to work the fish back to shallower water, at which point more pressing concerns arose. As I was by myself and not close to land, how would I land this fish? I decided to lead the fish into knee-deep water, then applied frequent side-strain in the opposite direction of the fish’s swimming path. I have found this confuses the fish, makes them uncomfortable, and tires them out more quickly. To my relief this strategy worked, and finally I could simply appreciate what rested in my hands in the water: a peerless competitor in green and gold. 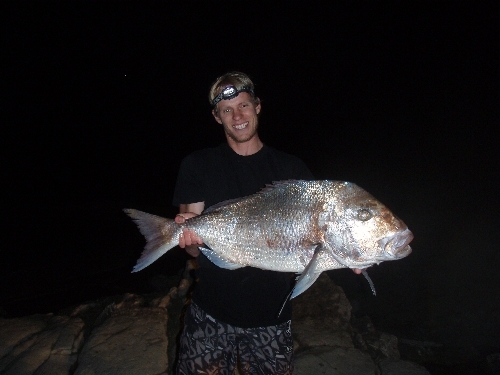 The 105cm king was healthy and beautifully conditioned, propelled by a large, twin-pointed yellow tail. Perfection in a fish. I took the hook out and watched it swim steadily away.